In the 2012 Okanagan Spring taster pack, they have four beers, the 1516 Bavarian Lager, Hopped Lager, Brewmaster Black Lager and a Pale Ale. This review is of the Hopped Lager. I'm a huge fan of lagers that use an abundance of hops. Why? It gives it a nice zing to the beer. A regular lager usually lacks it, so hops helps make the beer more bearable. 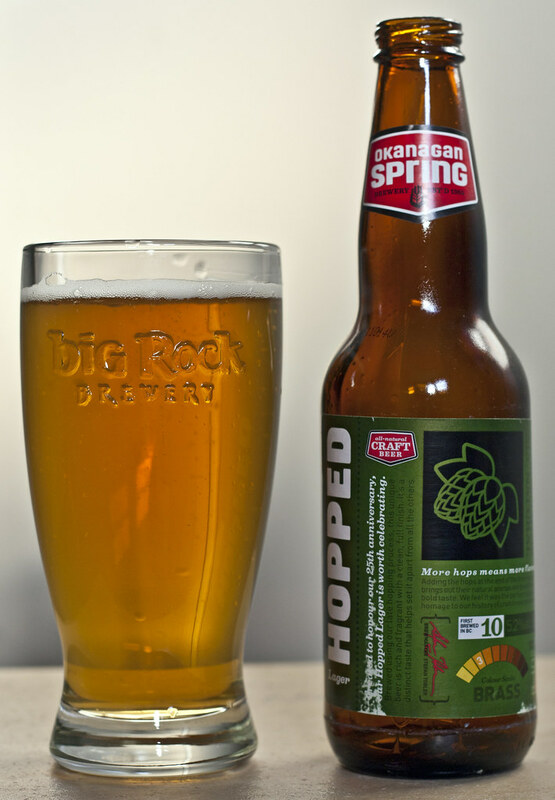 This beer was introduced as part of Okanagan Spring's 25th anniversary. Appearance: Looks like the 1516 lager, pale golden colour, like straw. Somewhat hazy. White foam with some bubbley going on. Aroma: A bit of citrus and it's very known that it will be a hoppy beer. I don't generally like lagers but that citrusy hop aroma is very welcoming. Bit of a slight maltiness, like the 1516. Taste: Citrusy hoppiness, yum! If lagers had more hops like this, I'd drink more lagers. Hell, this is beer has more hops than "Alexander Keith's India Pale Ale" - which is a blasphemy for a "beer." Overall Thoughts: Love hops but want a lighter beer? This beer is for you! It has a nice combination. The hops aren't overpowering, but you do know they're there.